From I-275 N take exit 46B toward FL-574/MLK Jr BLVD, Merge onto N Taliaferro Ave, Slight right onto E DR MLK JR BLVD, turn right onto E MLK JR Blvd, Turn left on N Nebraska, Turn right on E Curtis St. Property will be on right. Hello, I’m interested in 1103 E Curtis St and would like to take a look around. 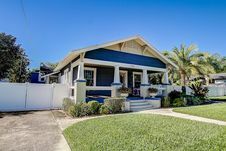 The details on 1103 E Curtis St: This house located in Northeast Tampa, Tampa, FL 33603 is currently for sale for $529,900. 1103 E Curtis St is a 2,186 square foot house with 5 beds and 3 baths that has been on Estately for 8 days. 1103 E Curtis St is in the Northeast Tampa neighborhood of Tampa and has a WalkScore® of 71, making it very walkable. This house is in the attendance area of Edison Elementary School, Middleton High School, and Mclane Middle School. Listing Courtesy of: MFRMLS and REDFIN CORPORATION.